Mahin did link to this video in late May, and because I was another one that was using MAC cleaner and not really having results that I liked, I decided to give the whole system a try. So yes, this is one of those posts where I do the stupid things so you don’t have to. Ok, not quite “stupid”, as this method works WONDERS. I managed to find the exact Da Vinci brush soap; I got it with a pack of mixed Brush Guard, and a separate 15-unit unbranded “guards” too. And then I got washing. I was amazed. I had a few brushes that I thought were permanently stained with pigment or gel eye liner suddenly looking *clean*. And I mean fully clean, with white bristles recovering their original colour. 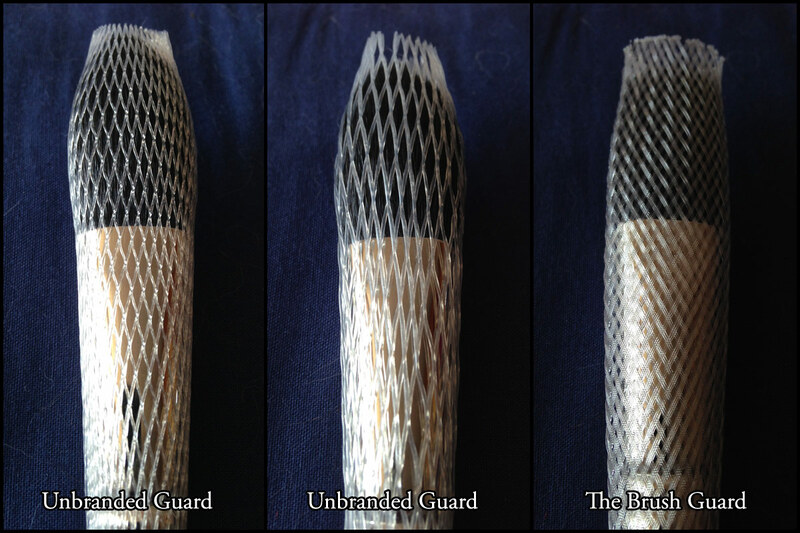 Even better, the Brush Guard suggested in the video allowed me to “recover” a few brushes that had been a bit battered for whatever reason (bristles getting caught on lids or zippers, for instance) and that now, after drying properly inside the guards, have recovered their real shape. Everything feels soft and clean, and the proper Brush Guards allowed me to put the brushes upside-down inside a mesh-sided pencil holder to dry. You might have noticed that I said “proper” Brush Guards. This is because the unbranded ones that came from China, despite being about 1/4 of the price, were marginally useful at best. The mesh was way too soft, which meant no upside-down drying in them. 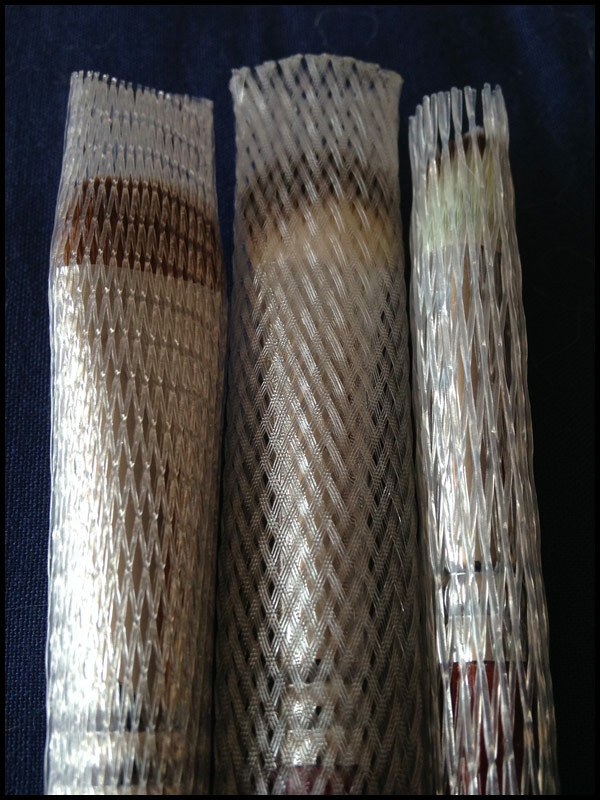 The mesh was also nowhere near as dense as the Brush Guard ones, and therefore bristles were constantly poking out even when using them to dry brushes flat. Even worse, some of the meshes were WAY too big and therefore not dense enough to keep any brush in shape at all. So I ended having to move the original Brush Guards in between brushes to get them to do their job. 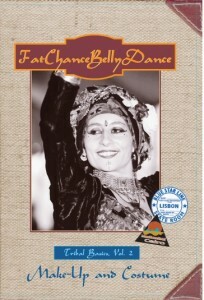 Fat Chance Belly Dance have made their volume 2 available to view for free online. The resolution is rather low at 640x480px, and the quality looks a bit grainy, but this has more to do with the original date of the video (1994) rather than any purposeful quality reduction for online viewing. You can find the whole of the vol. 2 here http://fcbd.com/make-up-and-costume/, in 13 chunks that have been uploaded to Vimeo. There’s a lot of explanation about the whats and whys of ATS costuming, and a few things said in it clarify some things that were not at all clear in the FCBD patterns sold through Folkwear. It also talks about things like choosing a single colour palette for the whole troupe to get a unified look.Overall, because it covers specifically stage make-up, it is worth watching even if you don’t do tribal or ATS, just to get a general idea of how to approach it if you think your stage make-up isn’t up to scratch. It’s not terribly detailed, and there are no real specifics about application or precise techniques like contouring, but there are plenty of videos available online that cover these, and if you still want more, there are blogs and even DVDs from people like Princess Farhana that specifically cover stage make-up, including things like body contouring (yes, there is such a thing). I am also having problems with Vimeo streaming, but that might be my own connection, but worst case scenario, you can watch the segments one at a time. Carolena has also very kindly allowed Vimeo users to download the files, so you can compile your own little DVD if you wanted, or keep the videos available to watch on your preferred mobile platform. Overall, well worth viewing at least once! I don’t often review make-up because I am a creature of habit, and I am rather settled in what I use, so there’s little “new”. Of course I could write about what I’ve chosen to use and why, but mostly, I just forget. Not this time. I was introduced to Aromaleigh, a mineral make-up company, a few years ago, and immediately loved the aesthetics they offered. I was new to mineral make-up and also new to applying pigments, and slowly, with the help of the people in the community, I became quite better about the treatment I gave my skin, and far more adventurous with make-up. And when I started dancing, I came armed with a bit more knowledge, a good set of brushes accumulated over the years, and a penchant for the dramatic. 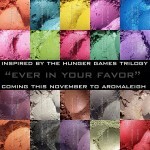 There are two types products of Aromaleigh that I use the most, the first being their finishing powders. I am not a fan of foundation, they almost invariable oxidise on my face, so I was after something that I could use to add just a layer of “barely there” correction. Their “Glamoured” finishing powder fits the bill, being what other brands present as “mineral veil”; they have light diffusing particles that make your skin look a lot smoother, and if you have, like me, one of those difficult tones, it can help you give a unified, radiant skintone, It looks fantastic on photos, it doesn’t run when performing, and these days I wouldn’t use anything else. I normally use it as a final cover, and finish setting it with a couple of pumps of Lush’s Aqua Roma (lavender and rose water). If you are after something that finishes and corrects but without the extra ethereal soft focus look, their Coquille product is the ticket. 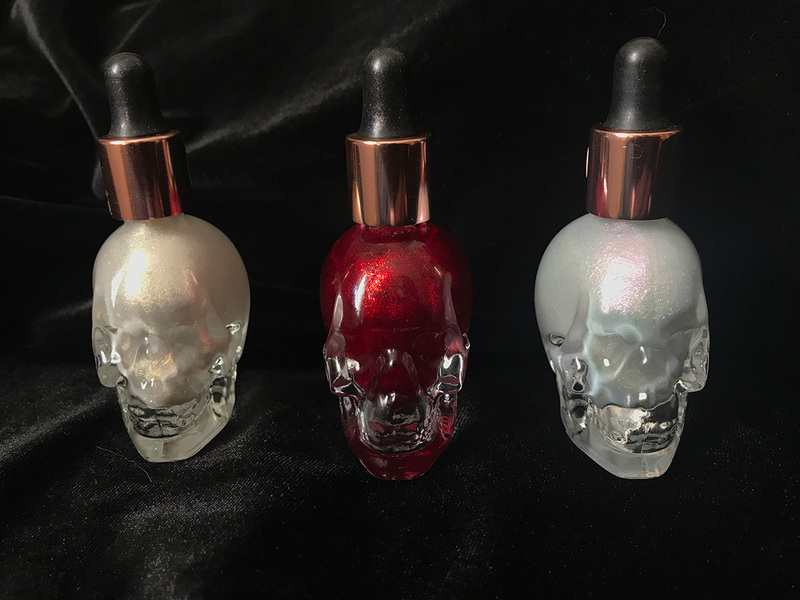 Both it and Glamoured come in different colours, and of course if you have specific areas that need different correction, the beauty of the minerals pigments is that you can do a mix or apply differently to get what you need. And if what you want is some sparkle, their Laluna powders will do the trick. Unlike most body glitter, which has a definite golden or bronzing base, or big and harsh glitter, Laluna comes in a very fine powder in a pale base with white/silvery sparkle, and in different size glitter, so you can go for a “barely there” illumination to your nose, chin and forehead, or an all out for arms, collarbones or wherever else you want. “Ever in your Favor” appears to be another brilliant collection, with bright, bold colours along rich deep ones. You can take a closer look at the collection here http://www.aromaleigh.com/hungergames.html, along with swatches and close-ups. Their swatches are accurate, although how the colours will look on you will depend a lot on whether you use primer, your brushes and application technique, and your underlying skin-tone. The little jars last forever, although you can just order samples, which are enough to test a colour, or have if you can’t see yourself using it that much. Shipping to the UK is reasonable, but only cost-effective if you place a big-ish order, so if you want to just give it a try, get together with friends who also want to try it. Every single time my make-up has been praised, it’s been a either pure Aromaleigh, or a mix of Aromaleigh with Illamasqua, so if you’re looking at building up your make-up bag, it would be well worth a try. 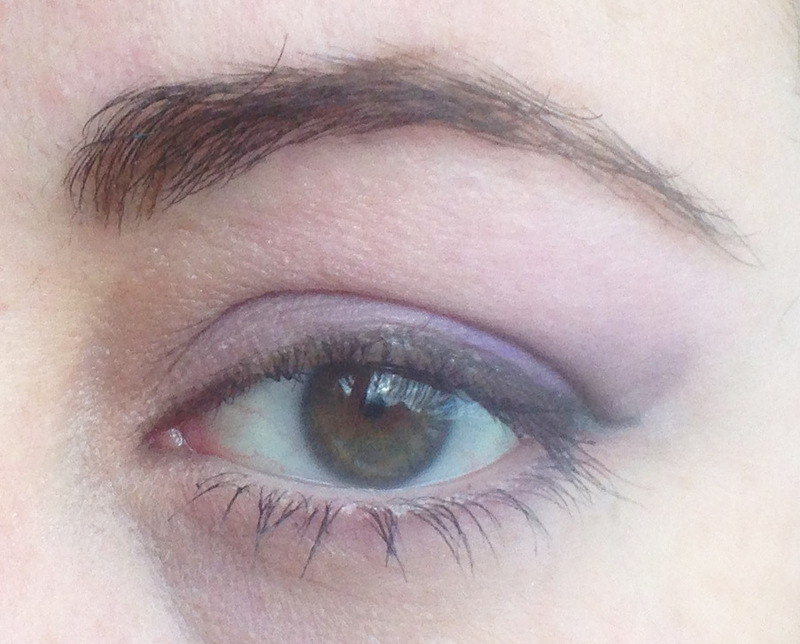 What I am using in the photos: on the eye, two colours from their Brilliant Deductions collection, called “Recreational Scolding” and “Surveillance Status”, and one from a previous collection called Tutu. Sleek’s Ink Pot gel eyeliner, Illamasqua’s Vow eyeliner in the waterline, Illamasqua’s Eyebrow Cake in Thunder, and L’óreal’s False Lash Architect mascara. My face has Garnier’s 5 sec Perfect Blur and Aromaleigh’s Glamoured in Triteleia. Eye liner features heavily in Arabic make-up, and it’s the one cosmetic that nearly every belly dancer I know uses, even if they don’t use anything else. There’s loads of them in the market, at vastly different prices and styles. I often get complimented on my make up for performance, so I thought it would be a good idea to review a few of the items I’ve got or use. I tend to have a very magpie approach to cosmetics and particularly make-up, and if I like it, I will generally give it at least a try. This means I can use vastly different brands, and have been known to use several different eye liners on a single make-up style. I tend to use winged style darker liner on the upper lid, a faint slightly smudged line done with eye shadow and a slanted brush on my lower lid, a “brightening” liner on the inside, and sometimes white liner on the lower waterline and black on the upper waterline. Why, yes, I *did* say I liked things complicated. For some things (like waterlines) I prefer using the traditional style crayons/pencils, as they are the only ones suitable for this. I use L’óreal Studio Liner in white, for instance, and MAC’s Greasepaint for waterlines, and although I have picked up the product from the Greasepaint stick with a liner brush and used this as a standard liner before, I do not like the efffect I get with them, mainly because they are quite thick. I am big on careful application so they just don’t work well for me on that front. Illamasqua Precision Ink in Glister is ideal if you are looking for a “barely there” delicate liner. There are some strong light-reflective prismatic pigments in it that add silver, gold and blue when the light hits it right, so it’s also ideal to add a hint of illumination without hitting the white or silver. Barry M released a pink metallic colour that has a similar feel to this, except that the pigments are mostly silverly, and the colour is *very* pink. 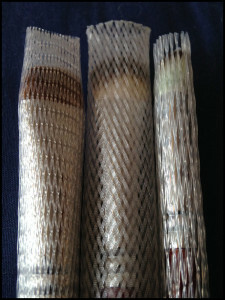 Barry M Metallic #4 (silver) is part of Barry M’s metallic line. The colour is nice, but the application is very difficult to do precisely. I’ve found that it also needs very short strokes reloading the brush with colour to get proper coverage. Love the colour, but I’m just not too keen on the formula. 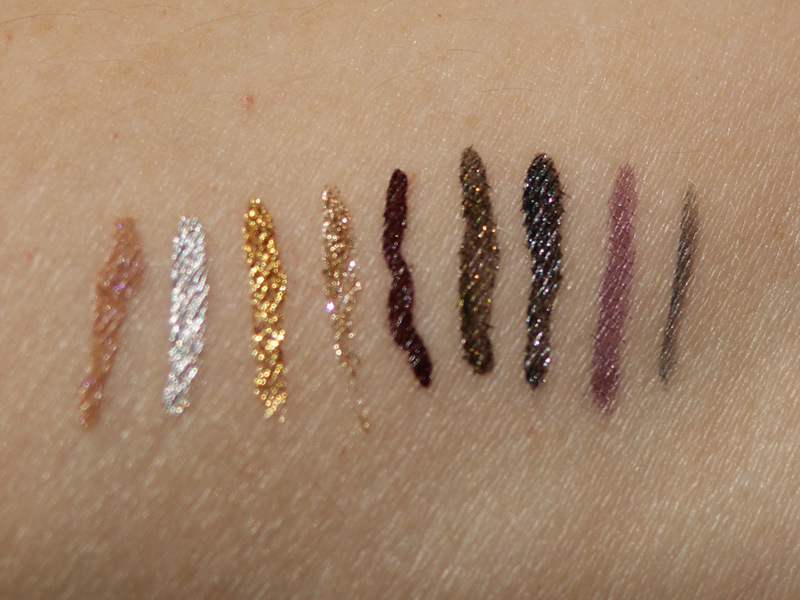 Illamasqua Precision Ink in Alchemy is by far the best metallic liner I’ve used. The colour stays on and just shines, and it does feel like you’ve gilded your eyes, and the pigment is lovely. Illamasqua has now added an antique gold variant, I just wish they did a silver, as gold does not work that well with my skin. MUA Glitter Shade 2 was picked at Superdrug for £1. The pigments are a bit more scarce, you can clearly see this on the swatch above, so you do need to go over the line several times. However, the colour is quite nice for those of us that don’t wear the warmer shades of gold that well. For the price, really you can’t complain. 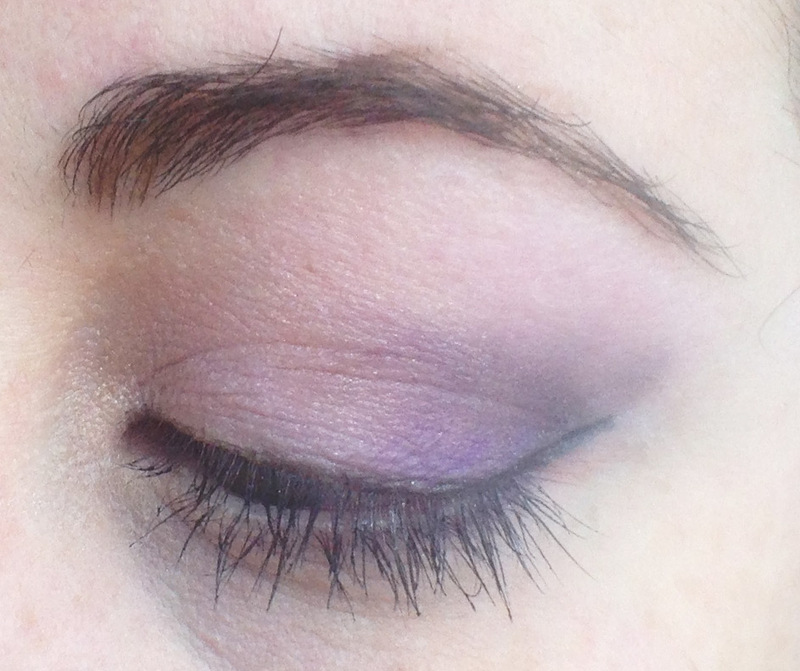 Illamasqua Precision Ink in Havoc is, by far, my favourite liner. It’s a very unusual aubergine/dark brown that is dark enough to add an edge but soft enough to work a treat as a day liner. The formula is similar to those of Glister and Alchemy, so very easy to work with, with superb staying power. Gosh Liner Pen 006 Black Brass is a metallic black with some hints of gold. The applicator on this line is not a pen as suggested by the name, but a pointed spongy brush, very similar to the Illamasqua ones, and, as Illamasqua, is also made in Germany. The formula is *slightly* less pigmented, and the applicator a hint thicker, which means you will not be able to do such fine work, but the difference is minimal. The colour is great for that extra shine and gets double points for being a slightly more unusual shade. Gosh Liner Pen 004 Grey is similar in application and formula to Black Brass. The colour is a lovely shiny pewter, which, again, works really well for day make-up too, and adds that extra glitter for the evening. My one complain with these Gosh Liner Pens is that removing them requires a bit of extra rubbing to get rid of it all. There are other colours in this line, including metallic Black, metallic Turoquoise, and Brown, which is particularly nice and a much lighter and softer tone that most browns are normally. Gosh Intense Eye Liner Pen 05 Purple is a proper “pen” with a little felt-tip point at the end. As is quite clear from the photograph, the liner ends quite sheer unless you go over it several times, and smudges like nobody’s business. It just won’t stay put on my skin, and after several hours it had migrated from a well-delineated line on my upper eyelid to my lower eyelid and turned the wing on the outside of my eye into a smudge. You also have to be careful that you don’t accidentally loose the cap in your make-up box or bag, as it will be a goner. Takes ages to remove fully, even with specialised remover. I would not buy again. Sana Kyoto Geisha Maiko-han is japanese, from a whole line of make-up inspired by geishas. Unlike nearly every other “pen” style liner, this one has proper bristles in the brush, and therefore gives you superb control, allowing very thin lines without risking poking your eye out. It also stays put, but the dissadvantages are that it also takes a while to remove, and the color is not that intense unless you go over it several times. It’s also very difficult to find, some surface on eBay every now and then. They do it in black and red, but I haven’t been able to find the red anywhere, and the person who bought it for me in Hong Kong couldn’t find it either, sadly. Overall, the Illamasqua liners win hands down, and they are the ones that I reach for again and again, whether it’s for day, night or performance. They can withstand a sprinkling of water, sweat, or even some light rain without running or turning me into a demented raccoon, and therefore are ideal for performance, but unlike others that have staying power, they wash away very easily with make-up remover without needing to scrub the delicate skin of the eyelids. Having said that, “you get what you paid for” is doubly true in this case, and Illamasqua’s products, brilliant as they are, can be pricey. They do run deeply discounted sales a couple of times a year, though, so if you wait for the right time you might be able to pick up what you want without paying that much. Legal Disclosure: I was not paid for writing this review, nor I received any free service or product.